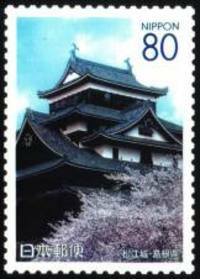 I like the older stamps of Japan, back in the days of engraving. I like the colors of the inks they used. There's an amazing amount of detail in these little pictures. 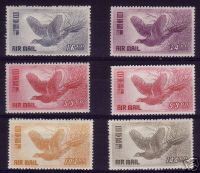 Modern stamps use 4 color printing. A mixed blessing. These are nice modern stamps. Attractive images that evoke thoughts of history, geography, community and nature with out hardly thinkin' more than what a nice picture. This is just crass commercialism. Part of the business. It doesn't really bother me. Give the people what they want. 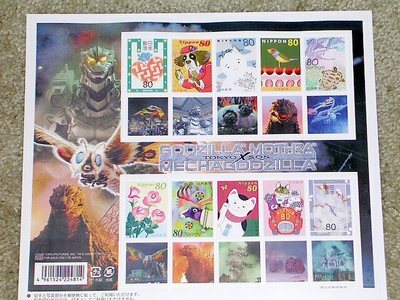 Here's some recent stamps from Japan. 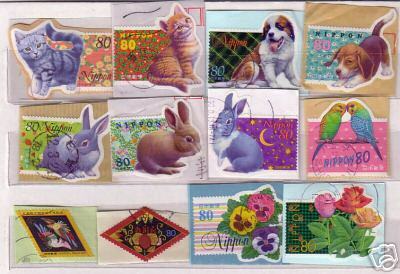 These are the kind of stamps that give me diabeties just from looking at them. These stamps would appeal to the Topical collector. Cats, dogs, rabbits, flowers, birds. All these are collectable for their own sake, and they are funny shapes, another topic. Bonus. Post offices are always looking for a way to increase the profit. It's no wonder collectors bail or stick to the past. Still, I always figure that subdivisons in hobbies are good. Everyone isn't looking for the same thing, that's good. Competition is only good for the buyer, and only from his unique perspective.